Created in honor of Mother Teresa's canonization, this collection offers songs that capture Mother Teresa's spirit and passion for serving the poor. 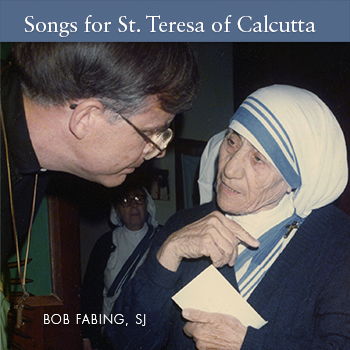 In honor of Mother Teresa on the occasion of her canonization, OCP is proud to present this MP3 album compiled of Jesuit Father Bob Fabing's Mass for Teresa of Calcutta and a variety of his other songs inspired by her selfless acts. Father Fabing had a unique relationship with Mother Teresa and over the years worked closely with her and the Missionaries of Charity, the international religious congregation she founded. All in all, the 17 tracks on this digital album paint a beautiful musical picture of a life dedicated to serving others. Approachable and welcoming, the Mass setting features easy-to-sing melodies that quickly endear themselves to the assembly. Among the other songs on this special collection is "Your Song of Love," which Father Fabing wrote for Mother Teresa and sang at her beatification by Pope John Paul II in October of 2003. All in all, this collection offers a beautiful way for Catholics the world over to join Father Fabing in remembering this much admired advocate and champion of those less fortunate.